Gone are the days when field workers would collect data on a paper, and spend hours interpreting and analyzing it. Today, everyone wants instantaneous results, for which it has almost become necessary to go paperless and adopt technology like never before. Technology has enabled seamless communication, real time updates as well as data transfer among the different verticals. Taking notes on paper, converting them for the digital space, assessing and interpreting data are all old-school methods, because we are living in the age of enterprise mobility. 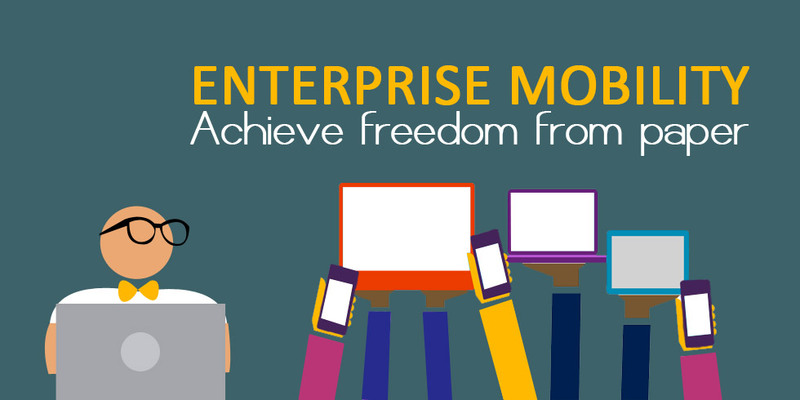 Enterprise mobility enables workers to go mobile, use mobile devices and be in touch with others on a real time basis. The changing business dynamics,reliance on technology and easy accessibility to technology has made enterprise mobility solution important. Basically, enterprise mobility allows workers to go paperless. It has prompted the use of smartphones or tablets to collect data, upload the same on the cloud and get others connected instantaneously. Businesses today are continuously grappling with issues of productivity. Everyone is continuously striving to make work processes fast and reduce the bottlenecks. Every business owner understands that the only way to increase profit is by improving productivity. With enterprise mobility solutions, businesses now stand to gain more, get their employees to work more efficiently, thus streamlining workflow processes. With enterprise mobility, one thing that businesses can be sure of is accuracy. When work is accessed using mobile forms (which interprets data entered immediately), accuracy and speed are guaranteed. This level of instant accuracy could not be guaranteed when work was done using old school methods. Adding to the benefits of accuracy, enterprise mobility also ensures that work orders are received and updated in real time. For example, invoices can be prepared on a moment’s notice, research data can be interpreted immediately and easy accessibility to cloud services will allow employees to be in constant touch with each other. Every business looks to find methods of cutting costs without compromising on quality. Since enterprise mobility helps advance business processes and improves efficiency, it also expedites the process to complete any work. With work and effort getting streamlined, businesses can now think of saving money and channelizing their resources towards other tasks. Money is also saved because enterprise mobility simplifies tasks, letting employees complete a specified task in less time. Gathering data is easier and faster. It also manages to reduce the work load. You are visible on the digital world, hence you don’t need the added burden of showcasing your work through catalogues and brochures. It is only natural for forward-thinking businesses to look for the best mobility solutions and implement them in their workspace. Semaphore Software is an enterprise mobile app development company which helps you develops niche enterprise mobility solutions that meet your business needs. Contact us through info@semaphore-software.com to know more about the services we offer.